Avril’s wallhanging quilt ‘Laravera’ is inspired by the painting La Primavera by Botticelli, incorporating applique flowers and carefully chosen fabrics and colours. 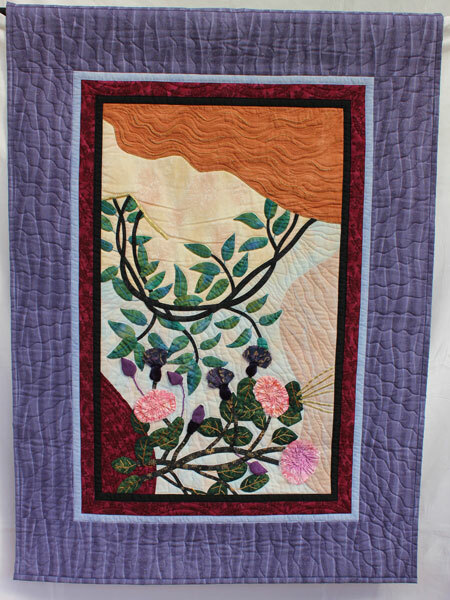 This quilt represents the kind of work that Avril returns to frequently; landscapes, flora and fauna. Later she talks about the costs of quiltmaking, commission quilts and what she looks for in others quilts. Gilly Thomson [GT]: This is ID number TQ.2015.18. The interviewee is Avril Clark. The interviewer is Gilly Thompson. It’s in Gilly’s house in Inverness on the 17th of April 2015. And Avril is going to talk about the quilt she has chosen. Avril Clark [AC]: Yeah, I brought this quilt along, because I felt it had a lot of, a kind of style that I have and I’ve sort of developed. It, it’s a wallhanging size. It’s, it’s 47½ by 34½, so, and in it it’s a sorta stylised figure of a girl. The top part of it is her hair and it’s a sort of profile of her neck and down on to her dress, which is a waist level, a wee bit below waist level. The, the inspiration for it came from a Botticelli painting. At the time I was doing it a, a Botticelli painting had come up to Duff House in Banff and it was quite a big thing at the time to go and see it, and Botticelli was one of my favourite artists anyway. However, this one, this wallhanging is really based from the painting, the La Primavera, and in that painting there’s, a, a girl whose dress is all covered in flowers. I think it, it was a, a goddess, Flora I think. I can’t remember terribly well now, but I just loved the way the whole thing had flowers and sh… flowing shapes, very flowing shapes and these shapes really inspire me ’cause I use a lot of kind of flowing shapes in my work. The girl, the figure of the girl in the wallhanging is not terribly apparent. She’s kind of, as I say, more stylised. It’s, it is working more with shape than with a realism, you know. But you can identify with her flowing hair at the top, which I’ve quilted and embroidered strands of hair onto, again giving a very flowing shape. It tends to, the panel tends to flow from the left to the right generally. Her dress is covered in [interruption] appliqué. [GT: Okay.] The girl’s dress, the top part of the neck has entwined kind of vine-type idea, with leaves appliquéd on. Again very flowing kind of shapes, it looks a bit like a necklace in a way, sort of. As you come further down on the dress, it’s, rose, bush kinda idea, and the roses was really, they’re slightly raised off the surface, and I was really interested in the way Botticelli did kinda roses. They were… they were kinda oval shapes more and the, it sorta fascinated me and, but, keeping in mind that when he painted the picture, I felt that perhaps, well, you know, rose styles were different then, you know, and it could well have been a more oval shape than roses now, are changing all the time ’cause gardeners are doing different hybrids and what have you, sorta thing, you know. So, so that, was quite a bit of fascination for me. What I did with the roses, they have a sorta base appliquéd on and then I have organza, gathered up, in, you know, quite, a bit like smocking, in a way, but they’re, gathered up quite tightly and then I’ve decorated the edge of that with a tulip paint and it gives a really kinda, the whole thing has a really iridescent kind of feel to it, sorta pink and peachy roses. I have embroidered the veins on, the leaves, and I have a, a sort of thistle-type plant growing in between. Again that’s appliquéd and raised off the surface. The, the appliqué is needle-turned appli… appliqué. I, although I have some raw edges in the work I do I, I still quite like to have a needle-turned appliqué. The dress itself, which is sort of pale blue, and the skin tone on the right has a sort of chiffon over it, because again in the painting, the … figures had chiffony, kinda garments on and I wanted to try and capture that feel as well. In, in the panel I’ve used… the… the plants’ quite dark greens set off against paler pastely shades of the dress and the skin and I have a maroon border. It’s, it’s got a sort of inch border and then an, a maroony kinda colour, wine colour, maybe would be better describing it. Then a narrow pale blue border, about half an inch, and then the whole thing’s finished off with about a four, maybe it’s, maybe it’s a five inch border of a purple. I’m really fond of these combinations of colour. I like purples, and I like it combined with the wine colour, and I’m just really fond of that sort of colour combination. The, the panel is called Laravera and the panel’s called Laravera. The Lara bit comes from, at the time I was doing it, there was all these sort of Lara Croft films on and I felt that was a very modern kinda name and, of course, she was very action-packed kinda girl. Whereas the Vera bit comes from the painting itself, the La Primavera. And Vera I always felt was an older-styled name and it was contrasting, the sort of modern with the, the older name because the, the sorta the panel was from a painting that was done a long time ago and that, that was how I sort of arrived at the title. It was done, it was the final piece done at a time I was working for an exhibition and the exhibition was called Six Stitch, and it was with … I was exhibiting with five other artists, or quiltmakers, and I had to work … I had to … we didn’t … we weren’t set a theme, not that I can remember being set a theme but I had set myself a theme because I felt I needed something to focus on to develop a range of work, because I had a time limit to do it and, the, some of the work that I did for that, I do a lot of abstract kind of things and I had kinda started off in a more abstract way using lots of curved shapes, and this panel was actually the last one. I think there was about five altogether I did, and this was the last one, but interestingly enough it has a slightly more realistic kinda look to it than the other ones, and that had developed, I think, from working in this themed sorta way that I’d been doing, you know. The, I had chosen this today because … it links a lot with the kind of thing that, I have gone back to doing. I do a lot of different things. 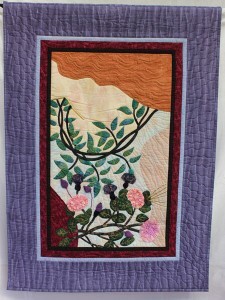 I do pieced quilts and all sorts of things. But when I, I lapse back a bit to this kind of style, quite often because I, I like the, the flowing shapes of it and I also have done quite a lot of landscape panels and the landscape panels are done in a very similar way because, you, you know, you’ve lots of flowing hills and rivers and things in the landscape and it, it just… it, it all links up to this kinda style that I have used in this particular wallhanging. 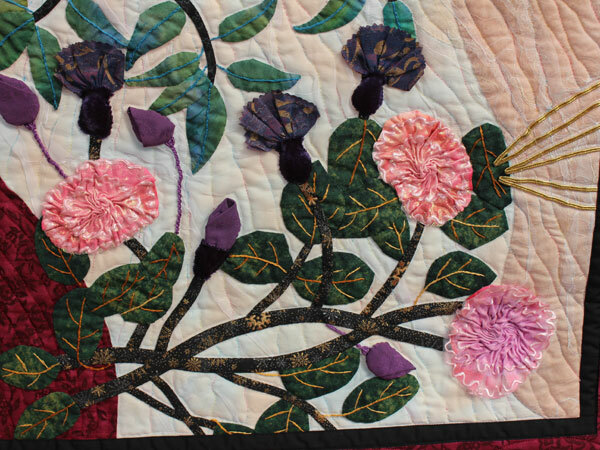 In the landscape kinda panels, I have appliquéd on plants and different things – animals, birds, yeah some of them have been kinda garden panels as well. So, again I’ve fallen back to using a lot of flowers and foliage and that kind of thing, and as I say, it’s an area that I, I’ve done quite a lot of work, linked to that, you know, sorta thing. GT: Hm’mm, hm’mm. When did you first start making quilts, Avril? AC: … it came from there. GT: Aha. Are there other quiltmakers in your family? AC: No … nobody … There, there are other sewers, you know. They were all, at the time it was all, like, dressmaking that everybody kinda did, but not quiltmakers, you know. In fact, I hadn’t really, I hadn’t really kinda come across it much, you know, until that time when there was more available, you were getting more books on the market then and I was becoming more aware of it and more aware of how big it was in America, you know, sorta thing. GT: So what are your preferred styles and techniques? AC: Um … it’, it’s difficult to say. As I say, I, I do like a lot of kinda abstract type of things, and appliqué. I do, I think, I think maybe, because of the textile printing influence, I kind of like to go… you know, I do drawing and sketching and things like that and the, the appliqué kinda thing lends itself quite well to that. But having said that, you know, I mean I have done pieced quilts and at the moment I’m working in a fabric shop and what I’ve been doing more of late is, you know there’s a lot of pre-cut fabric comes into the shop and a lot of rulers, and you know, to make piecing easier and I’ve found actually I’ve been quite hooked on using pre-cuts and fancy, well, not fancy rulers ’cause it is very geometric. It’s like … rulers for cutting your flying geese and things like that and storm at sea kinda rulers and building up pieced blocks, using them and, but that I, I, I realise, is because I’m influenced by what comes into the shop, and, you know, if, if I wasn’t in that situation, I think I would be more looking for seams, you know. A bit like this wallhanging, I would be researching it in a different kinda way, you know, sorta thing. GT: Mm. Where do you make most of your quilts? AC: We have a, a sorta studio space at home and upstairs in it I have a sewing room and, which is just full of sort of clutter and things like that. So I tend to work there. But then if I need to lay out a quilt or anything, because we’ve got the bigger space downstairs, we’ve got a, a very large table, I can lay out a quilt there, ready for layering up together and things like that, you know, sorta thing. GT: Hm’mm. So how much time d’you think you spend quiltmaking? AC: Yeah. Well, it’s, it’s difficult to say. I like to, I like to be doing something every day, you know, but it doesn’t always, it doesn’t always work out like that. I, I would, I dunno. I maybe would spend about an hour every day doing something. Other days, if nobody’s around and I’ve the house to myself, you know, I’ll maybe spend most of the day working on something. But it’s, yeah, I, I like to, I like to be involved with it every day, because of, as I enjoy it and that sorta thing, you know. GT: Hm’mm, hm’mm, hm’mm. The, and do you, what money do you spend on your quilting? GT: … have worked out? GT: And when you go to a quilt show what do you look for in other quilts, or notice? AC: Yeah, I think I’m attracted by things that I know I don’t do myself, in a way. Difficult to explain [laughs], trying to think of something offhand. Um … you know, very intricate things. Very intricate appliqué. I do like appliqué but … and I do do it but the very intricate kinda ones, like Baltimore and things like that, I’m, I’m amazed about with, because, I know maybe, the amount of time that’s involved with it, and things like that. Other things I maybe look for, is, I like a lotta mixed media kind of things, because I find that, the way … because I’ve dabbled in a lot of things, like … I think when you’ve got an interest in textiles, you maybe do knitting and sewing and, you know, you do a lotta different things and I actually quite like combinations where everything’s kind of thrown in and that attracts me, you know, sorta thing. There was a quilt, I visited Birmingham a couple of years ago and, oh, I can’t remember, maybe lady’s name but the quilt itself was, like, lots of fabric books put together and, I mean, you could’ve stood for ages looking at it ’cause, there was so much in it that it just kinda captivated you and, I really liked, really liked that, you know, sorta thing. GT: Hm’mm. 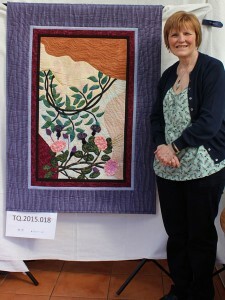 So where do you get the ideas, inspiration for your own quilts, then? AC: Well constantly, I think because my background was drawing and, teaching art and things like that, I was always looking for source material for pupils and that kinda thing and, as a result, any time I’m out I’m constantly looking or constantly aware of landscape and I take quite a lot of photographs and also collecting things. I mean, I can’t go out for a walk without coming back with my pockets full of things that I’ve picked up and, in turn these become inspiration for different things that you do, you know. GT: Hm’mm. Right. And what do you do with the quilts you’ve made? GT: Apart from your commission quilts. AC: Yeah. 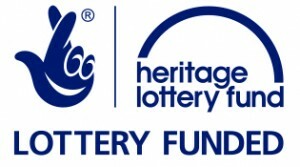 I, I keep, well I have sold quite a lot because I have had various kind of exhibitions and the most recent thing that I was involved in was North East Open Studios. I did that two years in a row. The first year was with my daughter, who’s trained as a fashion designer, and then the second year I did it with a friend who’s a weaver and the other girl was a painter and we set up, in the, the, the friend’s weaving shed. We had it for a week and people, well, we travel round and they’d come and visit and so I, I sell at various things like that. Other quilts, one or two, I give away, but the majority I have for my family, my immediate family have, that kinda thing, you know. So, yeah, that kinda idea. GT: Hm’mm. Aha. 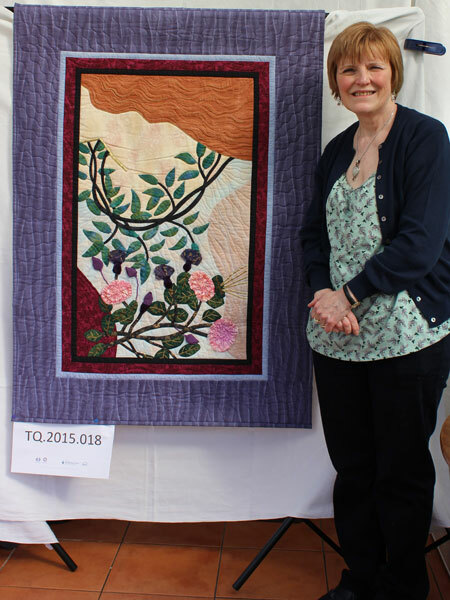 And what do you reckon is the biggest challenge you face as a quilter today? 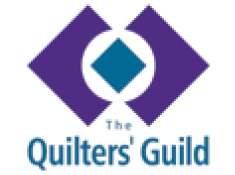 GT: So quiltmaking is important in your life? GT: Aha. Aye. Great. Fine. AC: Ah. Thank you. Fine.